P.F. Chang's is celebrating the Year of the Monkey by helping to raise $100,000 for Boys & Girls Club of America with a limited-time Chinese New Year Menu. My idea of Chinese food growing up was my dad's chop suey. Everyone in my family loved it. I remember thinking how worldly we were every time he made it as it was always enthusiastically inhaled by us girls. Of course, I learned later that it's actually an American-Chinese dish created mostly to appeal to American tastebuds but that doesn't diminish my love for the dish – it started my love affair with Chinese food. This Monday, February 8th is the start of the Chinese Lunar New Year. Also known as Spring Festival, it's a time to celebrate with family, relax, regroup, and of course, eat lucky foods to help usher in a prosperous year. Recently, I was invited by the folks over at P.F. 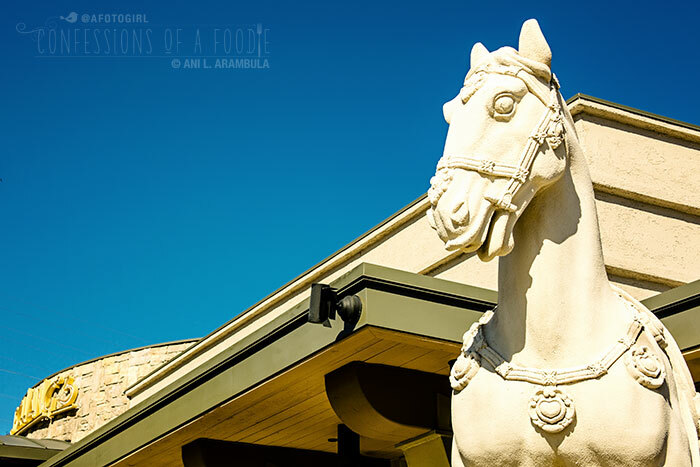 Chang's to sample their limited-time Chinese New Year Menu. When I was told that for the entire month of February, each time a guest orders an item off this Chinese New Year menu and when someone shares their Chinese New Year wish on Facebook, Instagram or Twitter using #PFChangswish, P.F. Chang’s would donate $1 (up to $100,000) to Boys & Girls Clubs of America, I knew it was something I needed to check out. I invited my friend Michael to escape the office for an hour and accompany me to our nearest P.F. Chang's in Fashion Valley. Luckily for us, the El Niño storm that hit over the weekend had dissipated returning our sunshine and lovely moderate temps so I asked to be seated outside. That way I could take photos without feeling like I was disrupting anyone's meal not to mention that I wanted to be able to guiltlessly spread out the dishes as I intended to order many items off the menu so we could share little tastes of everything. The Fashion Valley location has six new items on the special menu and we tried five of them, the sixth being a Sichuan Chili Garlic Chicken ($16.50) which, from the menu description, sounded too spicy for my blood. We started off our lunch with a Monkey Mule (it's the year of the Monkey, after all). 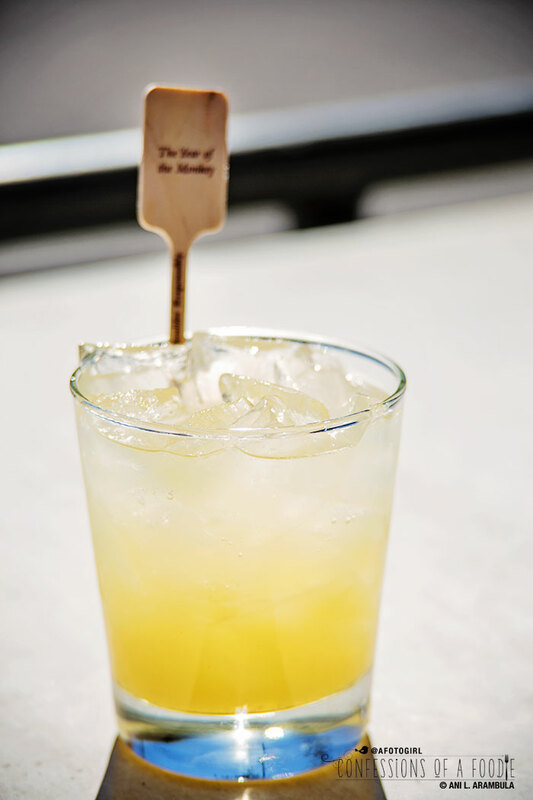 This refreshing ginger-forward cocktail is a wonderful mix of Monkey Shoulder Whiskey, P.F. Chang's house made Ginger Beer, peach syrup and, according to the menu, is supposedly garnished with an orange twist (our cocktail wasn't garnished). This light drink had a heady perfume, just hinted at sweetness and could easily become dangerous as it was so refreshing, I could see how someone would have no problem throwing a couple of these back in no time. Thank goodness for work lunch hours and conscientious employees who ordered one drink to share. Even between the two of us, we reluctantly left the restaurant with half the glass still full. Served in a rocks glass, this cocktail will set you back $10. The first of the entrees to come out was the Hong Kong Style Sea Bass. If you're a long-time reader, you know of my general aversion to most seafood. I'm working on overcoming this gastronomical quirk of mine, slowly convincing myself to try different kinds of fish, prepared different ways to see what I like and don't like. What I've discovered so far is that I like mild, white fish like cod and tilapia. And, now I can add sea bass to that list. P.F. Chang's take on the traditional Cantonese steamed dish was light, mild and healthy (and headless, thank goodness!). 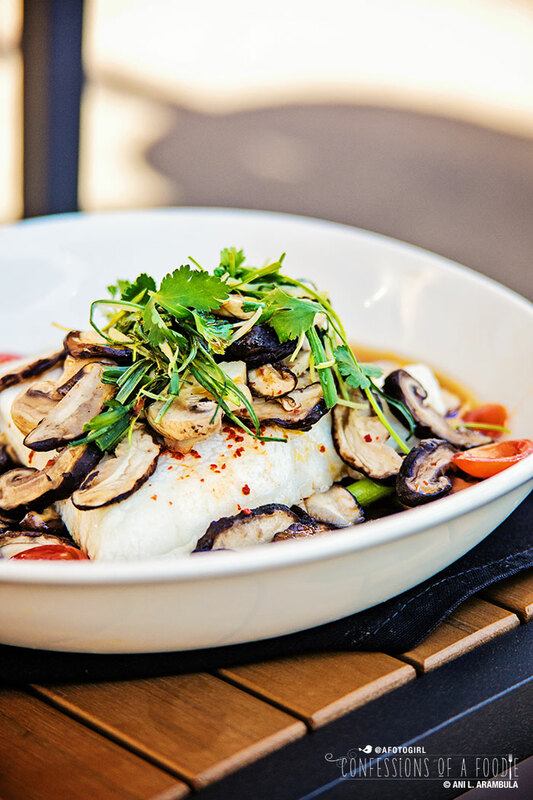 A generous filet of steamed wild-caught Chilean sea bass is seasoned with fresh ginger. 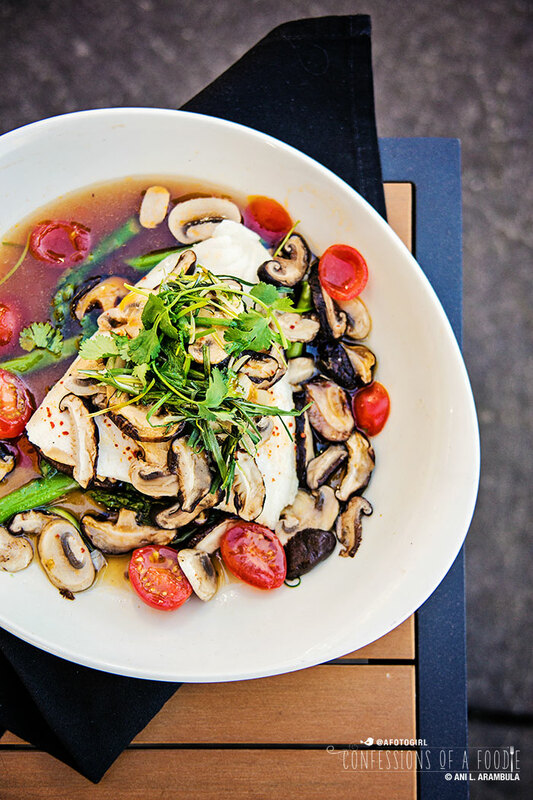 The filet is atop a medley of Asian mushrooms and is swimming in a delicate ginger-coriander broth. The addition of the non-traditional grape tomatoes added a hint of acid and the micro greens and fresh cilantro garnishing the dish added a freshness and another pop of color. Priced at $26.95, it's the most expensive item on the menu. The next lucky food to come out was P.F. 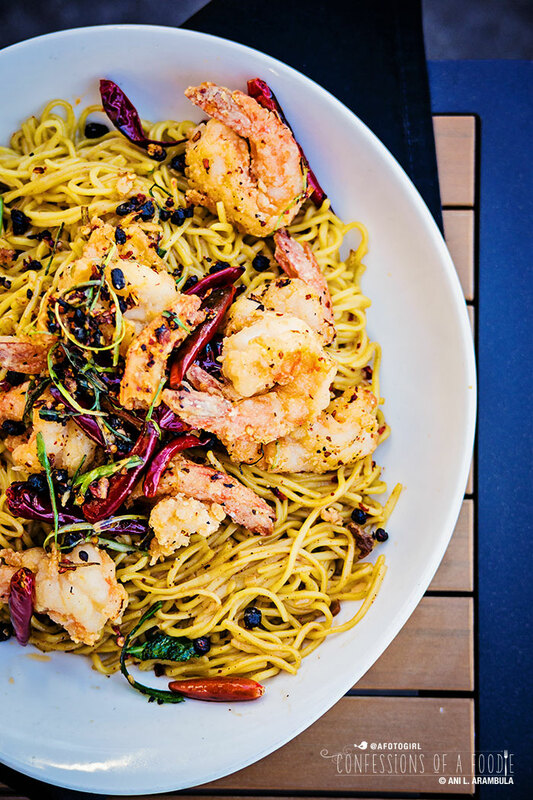 Chang's take on longevity noodles. The crispy garlic prawns in this Long Life Noodles & Prawns dish were my favorite part of the meal. I couldn't keep from picking at them. Nicely seasoned, crispy on the outside, tender on the inside, they made me forget I was eating seafood. The chilies the dish was pictured with on the menu scared me as I'm a bit of a heat wimp. When the dish came out, Michael tried it first and told me it wasn't hot. Being the heat baby that I am, I was prepared for his version of "not hot" to not jive with my interpretation of "not hot." I was right to do so. Though not spicy if you avoided the actual chili, the wok-tossed egg noodles (a guilt-laden treat for me since I rarely allow myself pasta these days) left me with just the right amount of tingly sensation on my lips and tongue letting me know the dish did indeed have chili. Priced at $14.95, this dish is a generous portion and easily makes a meal for two. Dumplings are another food considered lucky to eat for the Chinese New Year as their traditional shape calls to mind Chinese silver coins. 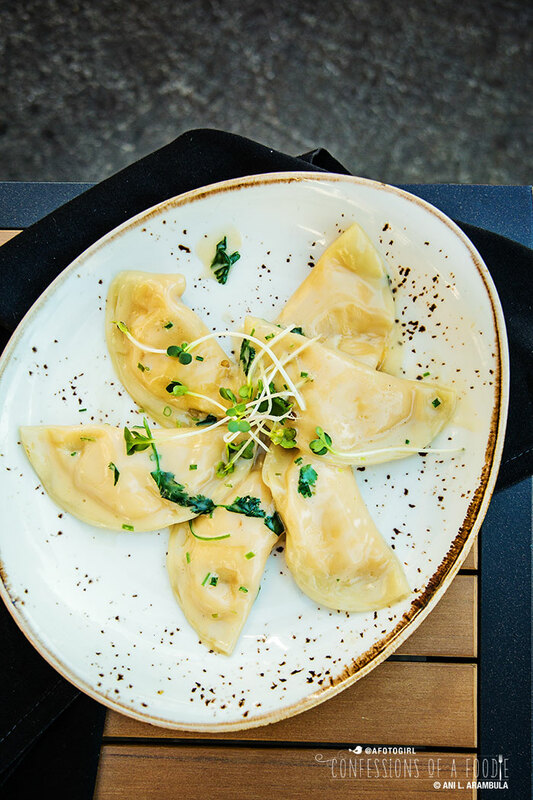 On the menu are these Handmade Butternut Squash Dumplings. Far from traditional, neither Michael or I could pick these out as being Chinese in flavor. We both agreed they'd be more easily mistaken as Italian ravioli. But you know what? We didn't care. They were heavenly little pillows of rich buttery squash goodness. Hand formed, these babies are served with a bit of umami butter sauce. Though Michael didn't discern cheese in the filling, there was definitely a creaminess to them that made me think that there was some soft cheese action going on in there. Cheese or not, these little dumplings will cost you $7.75. Due to the richness, I suggest ordering these as an appetizer to share as two dumplings were more than enough. We ended our meal tasting with the one dessert offering on the menu. Sweets are considered highly lucky for Chinese New Year as is citrus. Going for a double, this Mandarin Cake ($6.75) has made my "Favorite thing I ever ate" list. 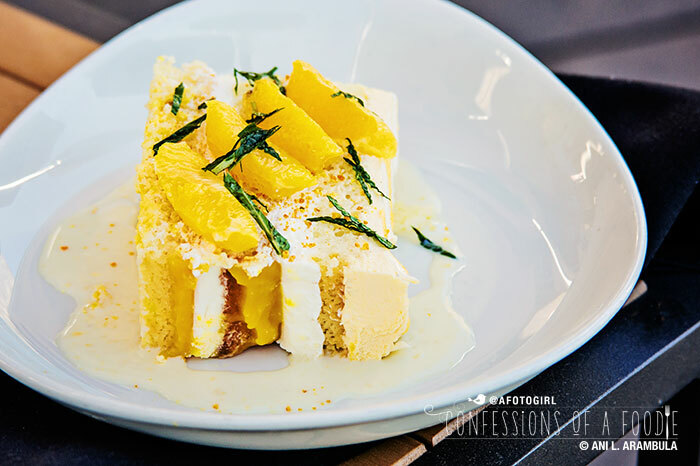 The menu does not have a picture of this cake and it's description of "Light orange sponge cake infused with a creamy vanilla sauce and topped with mint and fresh orange slices" does not do it justice. As Michael pointed out and I heartily agreed, this cake is bakery level good. Sandwiched between layers of cake, the light vanilla mousse-like cream is like biting into a billowy white cloud and when combined in the same bite as the mandarin curd, brings to mind the 50/50 orange sherbet bars of my youth. The cake is surrounded by a very light hand of vanilla scented sauce (read, not drowning in sauce which would destroy this cake and make for a soggy bottom). The cake is typical of Asian desserts in that it's not overly sweet like most American desserts can be. Although I enjoyed all the items we tried, watching what I eat and wanting to eat healthfully on the rare occasion I visit restaurants, the Steamed Sea Bass is a dish I am looking forward to guiltlessly ordering again before the special menu offerings end. P.F. Chang’s will be hanging traditional Chinese red envelopes filled with free offers on trees near its restaurants. 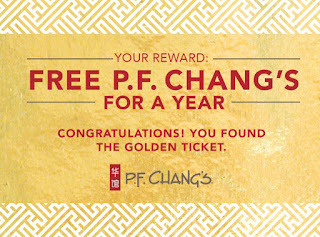 Five lucky winners across the country will open an envelope with a golden ticket for free P.F. 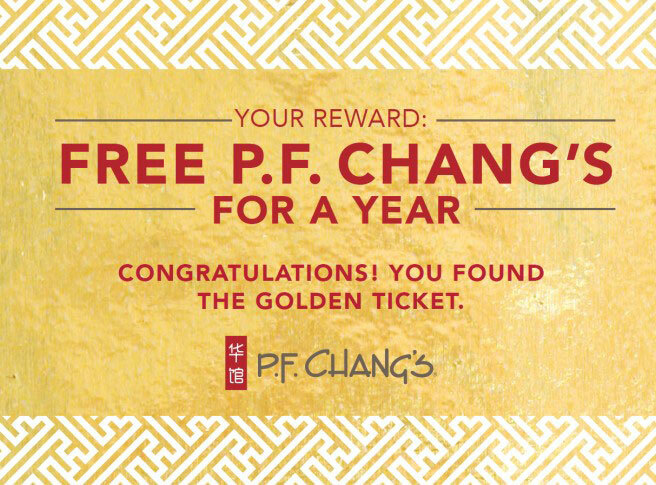 Chang’s for an entire year! Go on. Go get lucky. 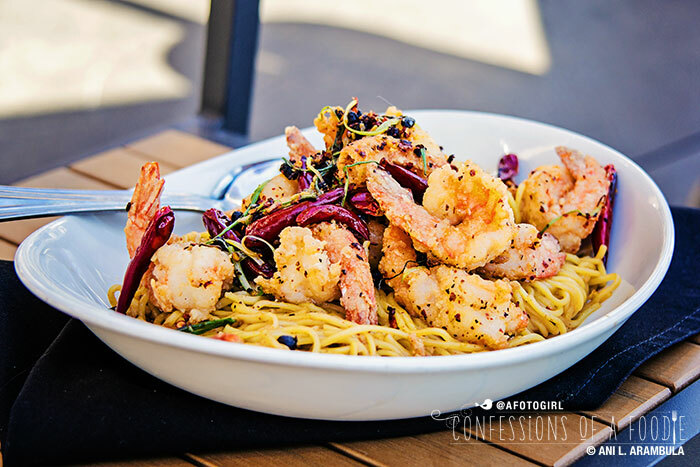 Disclosure: P.F Chang's sponsored this post by providing two gift cards valued at $20 each to use to help pay for my meal in exchange for an honest review. I received no additional compensation. As always with reviews here on 'Confessions of a foodie', all opinions are my own and not influenced by the sponsor.